Natural Resources Data Management System (NRDMS) division, and National Spatial Data Infrastructure (NSDI) of the Department of Science & Technology, New Delhi through a consultative working group meeting has conceptualized and initiated an innovative program in the year 2016 on the development, validation and standardization of data structure and the optimum data requirements providing a subtle framework for spatial data development and management at village level. It needs to be realized at this stage, that the mechanisms and scope of the Govt. agencies and the associated systems are not being able to fill the gaps to address the national needs. It is time that innovative systems need to be developed, tested and standardized before being implemented. The scope for collection of required data on spatial and temporal scales does not seem to be viable with the current structure, mechanisms and resources of government and professional agencies. At the same time, the rapid developments taking place in almost all sectors, the information at village level has become highly critical and vital not only to propose and design new developmental programmes but also to develop and manage the resources in a sustainable way. Keeping the objectives of VIS, two Gram Panchayats Charra, Distt. Dhamtari and Giraud, Distt. Raipur has been chosen as study area. Identify and design a spatial data model. Assessment, collection and collation of available data and supplement data gaps vis-à-vis developmental activities.Validation of data model. Development of an integrated information system using geospatial technologies. Development of decision support information modules to empower planners and citizens. National Remote Sensing Centre, Department of Space, Government of India in collaboration with different states, Central Government departments & institutions has completed the national land degradation mapping using 2005-2006 temporal LISS-III data 1:50,000 scale. Land Degradation is dynamic in nature & requires regular monitoring to understand areas of rapid changes & to access the reasons for the change. It was appropriate to monitor these things in every 10 years. This project includes generating thematic layer on various categories of degraded lands of entire Chhattisgarh state using outputs created previously on land degradation (1st Cycle) by using ortho-rectified three seasons Resourcesat LISS-III data of 2015-2016 using Bhuvan Web Geo Portal. National Remote Sensing Centre, Department of Space, Government of India in collaboration with different states, Central Government departments & institutions has completed the national wastelands change analysis based on temporal IRS satellite data of 2005-2006 & 2008-2009 executed on 1:50,000 scale. Relaible database on the spatial extent of wastelands is a pre requisite before embarking upon planning, strategies for their development. In order to bring out the spatial changes in the wastelands of the country as result of various developmental programmes happened during 2008-2009 & 2015-2016,department of land resources, mining & rural development, government of India felt the need to monitor the changes in wastelands. This project includes updating of wastelands vector layer for entire Chhattisgarh state of 2008-2009 using orthorectified three season Resourcesat LISS-III data of 2015-2016 using Bhuvan Web Geo Portal. The project is sponsored by NRSC, ISRO, Govt. of India under Natural Resources Census. The project includes mapping and monitoring of Land Use and Land Cover on 1:50,000 using multi-temporal LISS- III ortho-rectified satellite data of three seasons kharif, rabi and zaid for the year 2015-16. The mapping will be based on a National Standards Land Use/ Land Cover Classification System to meet the requirements of the various user agencies. Deliverable of the project will be a digital database on GIS platform, analysis of change detection, provide a spatial database on net sown area for different seasons thereby facilitating to monitor and assessment of total cropped area under rain fed and irrigated area. The project is sponsored by NRSC, ISRO, Hydrabad and includes correction of micro watersheds/project boundaries, monitoring & evaluation of IWMP projects using drainage layer, ortho-rectified high resolution satellite data LISS-IV and Cartosat, Bhuvan Web Services and Mobile apps, for the sanctioned projects in Chhattisgarh state from 2009-10 to 2014-15. Each project will be monitored for the period of 5 years from the date of implementation. 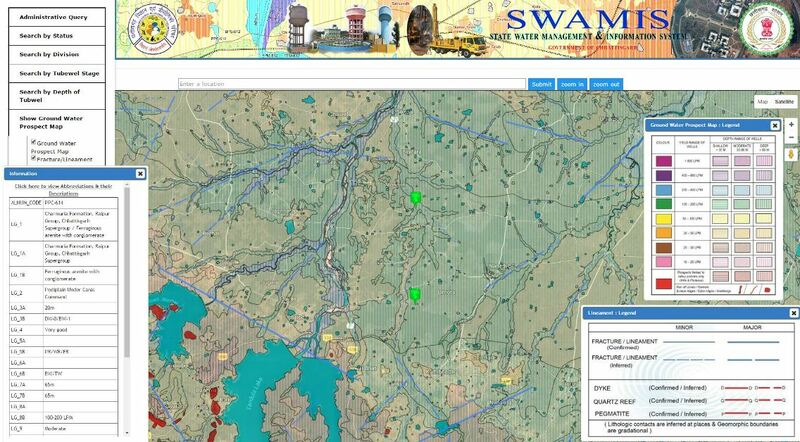 IWMP projectwise Land Use Land Cover maps for 5 years of monitoring for each of the project in Geodatabase format along with the statistics are being generated. The project is sponsored by NESAC, ISRO Government of India and being executed with collaboration of Central Silk Board. The project includes identification and mapping of potential areas for mulberry and non-mulberry sericulture development on1:10000 scale, to develop Sericulture Information Linkage & Knowledge System (SILK) for the selected two districts of Chhattisgarh i.e Sarguja and Balrampur. The beneficiaries include sericulture extension officials, farmers/ sericulturists at the grass-root level, Self-Help Groups, financial institutions like bank and Co-operative Societies, State Sericulture Directorates, Regional Development Offices and Central Research Laboratories/ Institutes of Central Silk Board(CSB). 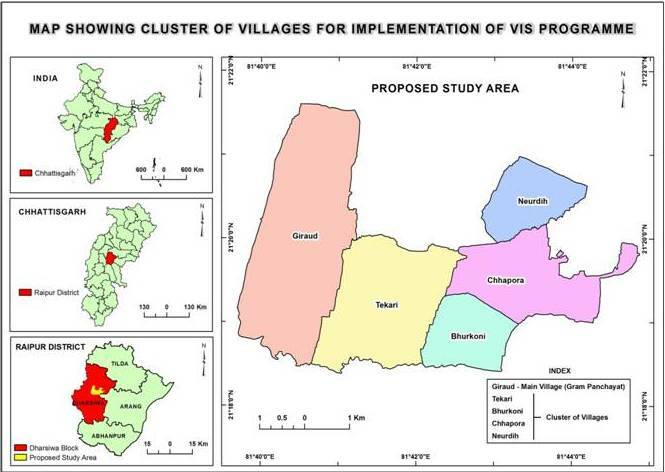 Important deliverables of the project will be district-wise maps and estimates of area suitable for developing silkworm food plants; report summarizing the area estimates and names of villages/ Panchayats/ Blocks suitable for sericulture in each district. "Empowering Panchayati Raj Institutions Spatially (EPRIS)" is a project with the goal to empower Panchayati Raj Institutions for resource-based and integrated spatial developmental planning in a user-friendly enabling environment. The main aim is to collect Monsoon data through remote sensing (RiSAT) and monitoring of crops when growing. Continuous & yearly Activity (For Kharif Rice). The programme is sponsored by MNCFC, Ministry of Agriculture and Farmer's Wellfare, Govt. of India. A team of ISRO/Department of Space, State Remote Sensing Applications Centers, State Agriculture Departments are working on this project. The main aim is mapping and monitoring of post Kharif Rice Fallow Lands using satellite remote sensing and GIS technique for expansion of ravi crop area. (Initiated in Feb 2017). This project is being executed in collaboration with NRSC, ISRO, Hyderabad, MNCFC, New Delhi and CCOST, Raipur(CG).This project is sponsored by MNCFC, Ministry of Agriculture and Farmer's Wellfare, Govt. of India. As per IBM Circular No. 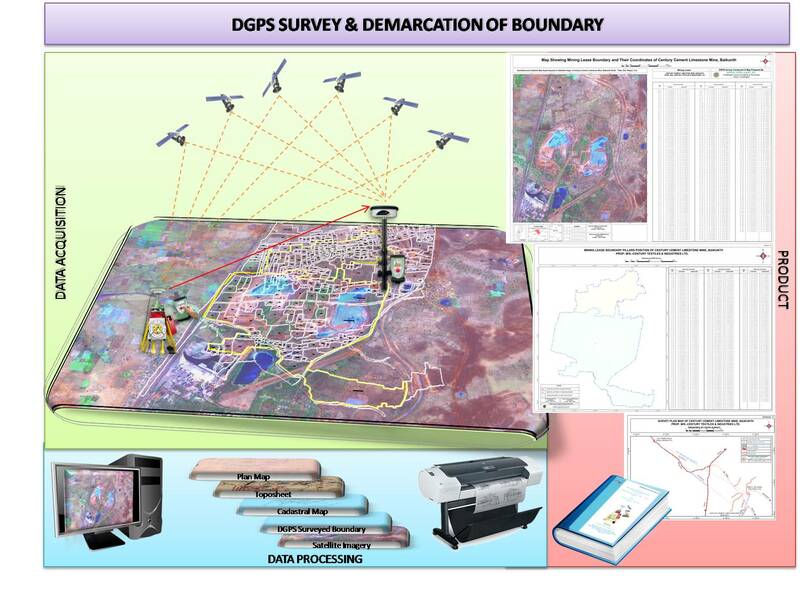 2/2010 dated 06-04-2010 and the guidelines of Ministry of Environment & Forest Conservation Act, for precise boundary demarcation, DGPS survey is being carried out for mineral block, Coal Blocks, Water Resources and Forest Boundary Demarcation located in various districts of Chhattisgarh. Project has been funded by various state government departments like DGM/CMDC/CSPGCL/WRD/CGTB/Home Dept. Generations of Coordinates of prospecting lease boundary as per IBM circular. Demarcation of forest land diverted for non forestry purpose. Murtadand Prospecting Block of Bauxite, Tehsil - Ambikapur, Dist. Surguja C.G. Sapnadar Prospecting Block of Bauxite, Tehsil - Ambikapur, Dist. Surguja, C.G. Kandraja Prospecting Block of Bauxite, Tehsil - Ambikapur, Dist. Surguja, C.G. Boundary Demarcation of Industrial Training Institute, Shaddu, Raipur, C.G. Mapping of the quality of ground water, particularly, using legacy data is a technically challenging task. There are many factors that govern the quality of the water and its distribution in space and time. Availability of data pertaining to all the governing parameters is also a major issue. For the first time in the country, an attempt has been made by NRSC to create such a map on 1:50,000 scale using the available data under Rajiv Gandhi National Drinking Water Mission (RGNDWM) Programme in the year 2011. District-wise Groundwater Quality Maps are being generated for both the seasons under GIS environment. Using fresh geochemical data (2013 onwards) of PHED, Chhattisgarh CCOST is preparing groundwater quality maps for PHED departments. Drinking water scarcity in village of Chhattisgarh State is a burning issue due to the severe drought situation during summer of 2016. Hon'ble Prime Minister of India has taken review of the drought in various states of the country and stressed on the use of latest space based geo-spatial technology for finding out new sources of drinking water. Towards this, PHED Govt of Chhattisgarh has taken an immediate initiative in using the space based remote sensing technology for finding out new sites for developing ground water wells and also identifying suitable zones through high-resolution hydro geological survey. Drilling of bore wells in remote areas and maintaining their scientific data online is difficult, CCOST has brought out scientific GIS data base of 7000 odd drilled tube well locations of Dhamtari district for development of decision support information modules to empower planners and citizen. 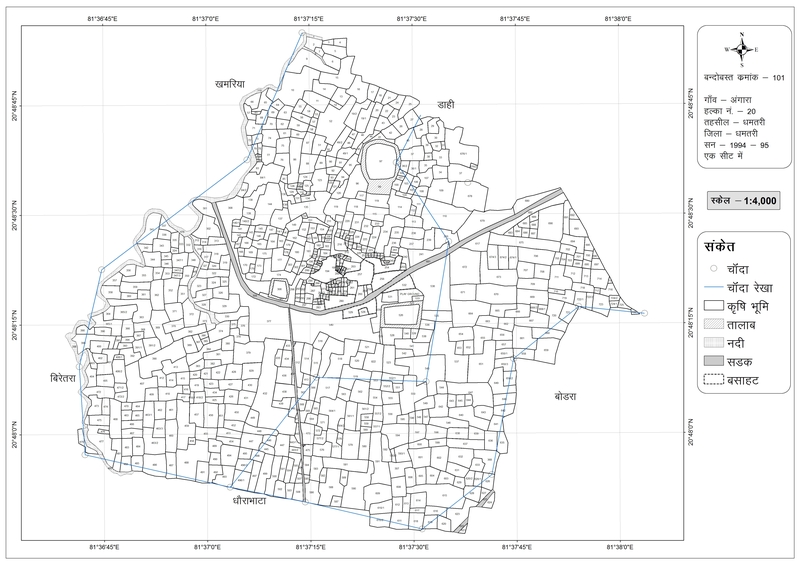 To modernise the land record and minimise the land property depute and enhance the transparency in the cadastral maps land record department has entrusted the digitization and data base creation work for 260 Cadastral sheets (1:4,000) of gap area of various district of Chhattisgarh State. Feature Extraction of Parcel / Plot Boundary and Building Outline Layers of Urban Area Using Aerial Photo (on 1:500 scales). Revenue Land Record Department of Chhattisgarh has entrusted the task of feature extraction of parcel / plot boundary and building outline layers for 10 major urban city of chhattisgarh using very high resolution aerial photo to Council. CCOST is preparing geo-based Nazul maps for urban areas on 1:500 scale. 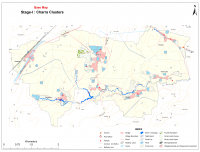 Mapping & formulation of GIS-based plan for 10 cities using very high resolution aerial data. Plot Boundary & Feature extraction (for GIS-based plan) from Geo-referenced/Ortho-rectified aerial photo. 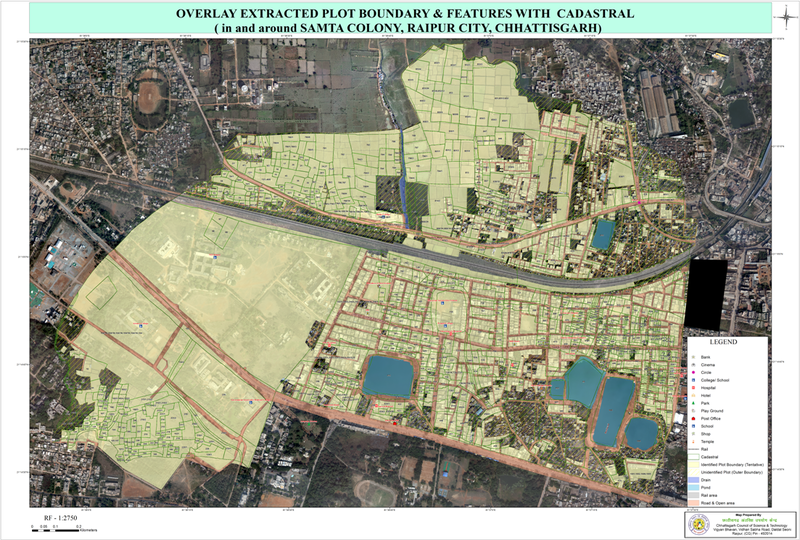 Overlay extracted plot boundary & features with best fitted cadastral layer for identification of real plot condition and generate unique plot id. The sickle cell gene, in India is distributed mainly in Madhya Pradesh, Chhattisgarh, Maharashtra, Orissa, Jharkhand, parts of Andhra Pradesh, Kerala, Karnataka and Tamil Nadu. In some communities, the prevalence of the sickle cell trait is as high as 30% of the total population. The high prevalence incidences in the state has been the premise for establishing a state-of-art institute in the state capital with a focused objective to address health issues arising due to sickle cell anaemic conditions. Transformation of Survey data to GIS compatibility. Linking of survey data to the Census datasets for standardization. 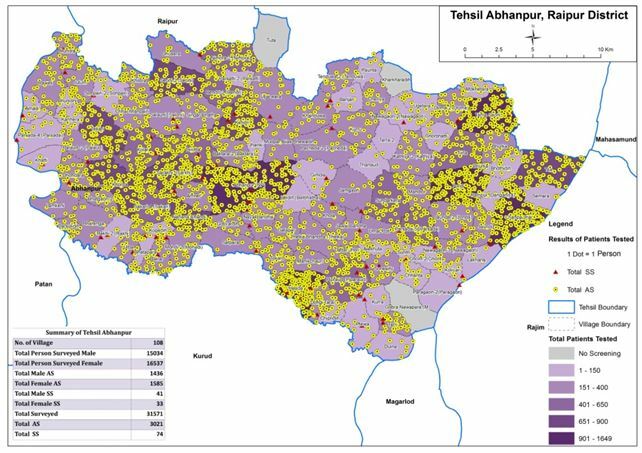 Preparation of Prevalence maps at tehsil level for all 09 surveyed Districts of the state. Create a Sickle Cell Prevalence Atlas of the state. Note : Click on image to view in large window.